Dr. Robinson began at Akron Children’s in 1963. He developed the Genetics Center and one of his main focuses has been the diagnosis, treatment and prevention of birth defects. Editor’s note: Dr. Robinson passed away July 24, 2017. Read the obituary. For years a statue of Don Quixote overlooked a desk piled high with microscope slides and stacks of articles. Like the statue, its owner is a little more worn around the edges than when he first came to Akron Children’s Hospital 54 years ago, but his accomplishments have been those of sky-reaching proportions. He is Haynes B. Robinson, Jr, MD, who is retiring this year as director of the Genetic Center. The patients he’s served and the programs he leaves behind are proof of the impact he’s had on our region and state. One of Dr. Robinson’s main focuses has been the diagnosis, treatment and prevention of birth defects. 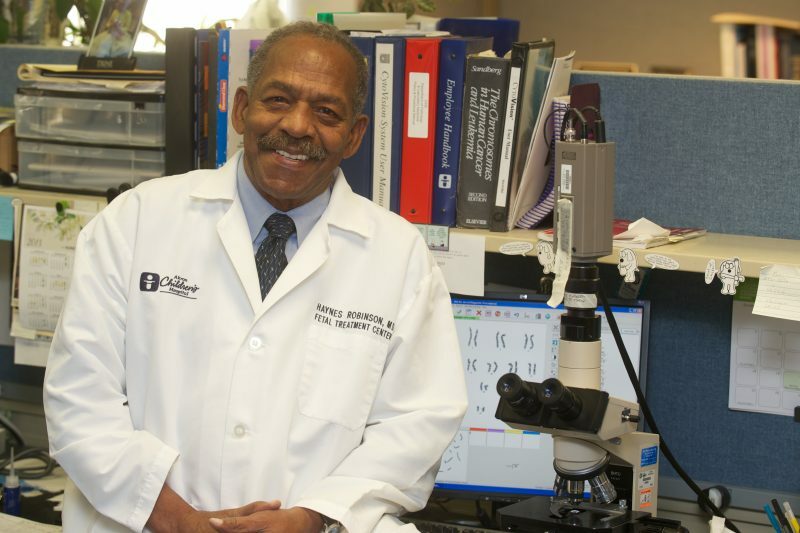 This began in 1963 during his pediatric residency when he was part of the team that identified the first chromosome abnormality at Akron Children’s. 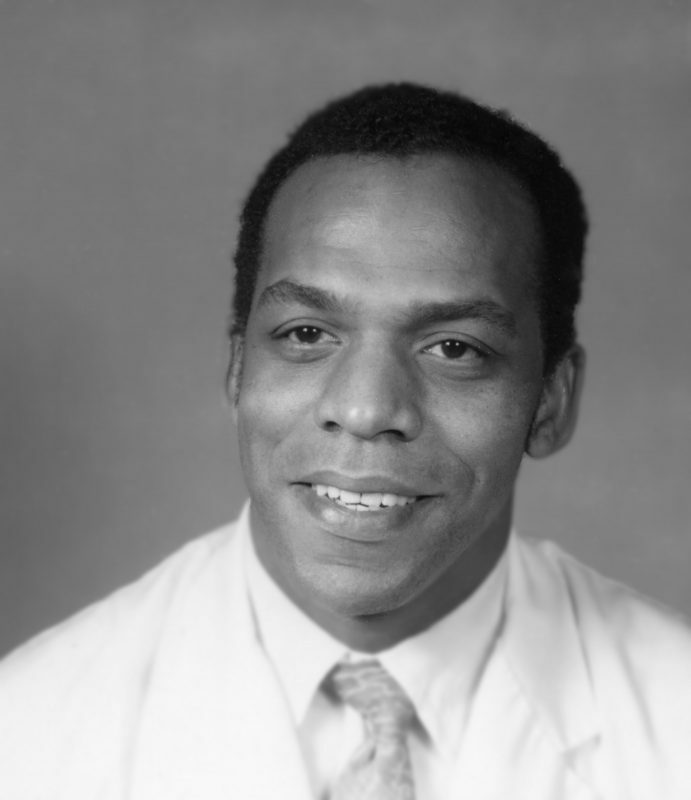 Dr. Robinson left Children’s for a pathology residency at Roswell Park Cancer Institute in Buffalo, NY, and returned to Children’s in 1970 to become director of the newly created cytogenetic lab. By the next year, cytogenetics performed 70 chromosome studies (karyotypes), and 20 years later the number rose to over 1,500. In his modest style, Dr. Robinson credits the lab growth to Jim Malone, cytogenetic supervisor and colleague since 1973. According to Jim, Dr. Robinson kept the lab on the cutting edge of technology by talking directly to the innovators in the field. Another one of Dr. Robinson’s ideas was a regional genetics program. He credits its beginnings to a request from then director of neonatology, Dr. Gary Benfield, to talk to a family who had just lost a child. At this point, neonatology and pathology started studying malformations in babies in the neonatal intensive care unit (NICU). Dr. Robinson joined others in the state in lobbying the Ohio Legislature to form what later became the Ohio Genetics Network. Since 1977, under Dr. Robinson’s leadership, Akron Children’s Genetic Center has become a major force in Ohio. It began an Ohio Department of Health (ODH) grant for $20,000, with 1 geneticist and 1 genetic counselor serving 74 patients. In recent years, staff has grown to 4 geneticists, 8 genetic counselors and 4 support staff and a yearly ODH grant of more than $400,000. These areas included pediatric, prenatal, cancer and metabolic genetics and a fetal autopsy program to help families find answers to miscarriage and stillbirth losses. According to Dr. Robinson, his biggest accomplishment was the regional fetal treatment center, now known as the Fetal Care Center, which he helped form in 2002. One of those genetic counselors, Susan Woods, attributes the genetic center’s growth to Dr. Robinson’s quest for answers for families. 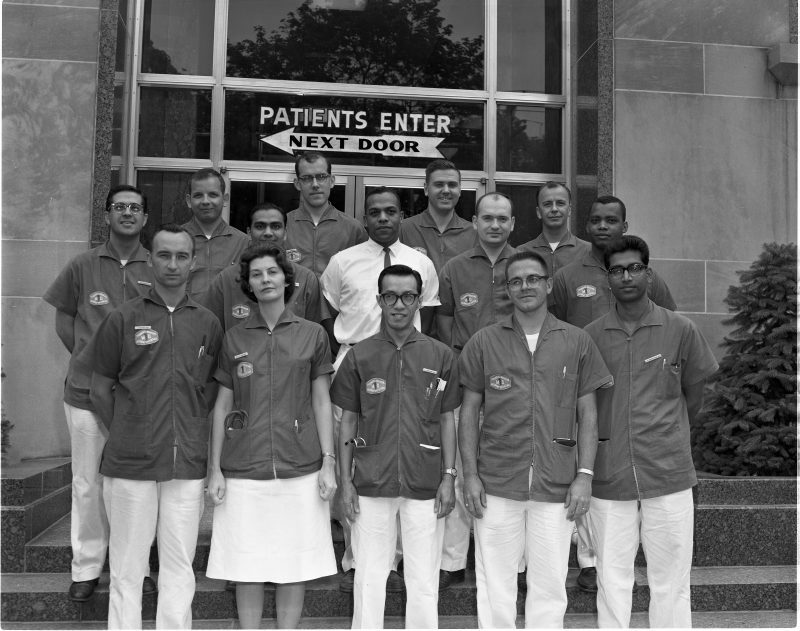 Dr. Robinson is pictured here (center) with other residents in the early 1960s. Dr. Robert Stone is also pictured (second from left, back row). Another area Dr. Robinson has championed is education. From training high school teachers on genetics in the classroom to explaining birth defects mechanisms to medical students, he has promoted a quest to seek answers for complex disorders. He has received numerous awards for these accomplishments including Akron Children’s 2012 Distinguished Service Award, and leadership awards from the Summit County Historical Society and the Akron Urban League. The accolades he treasures most are the ones from families he’s served. As to the future, Dr. Robinson plans to continue as a consulting geneticist for Children’s regional Skeletal Dysplasia Center, as well as continuing current work on a genetic counseling computer application. He envisions a unified center of excellence that includes clinical and laboratory genetic services at Akron Children’s as part of a larger collaborative with Maternal Fetal Medicine, the NeuroDevelopmental Science Center (NDSC) and other pediatric services. Don Quixote’s declaration, “Thou hast seen nothing yet,” still applies to Dr. Robinson as he leaves with more up his sleeve. However, on a day-to-day basis, patients and staff will miss his warm, “How you doing?” in the hallways of Akron Children’s Hospital.